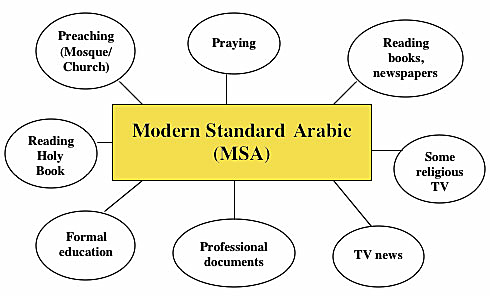 The school subject Arabic involves the students learning Modern Standard Arabic. The students do not have the opportunity to practise the language while shopping or conversing with people from the Arabic community, as these activities are typically conducted in one of the Arabic dialects, not in Modern Standard Arabic. As part of our project, students took part in several activities aimed at providing them with opportunities to practise their Modern Standard Arabic. These activities were designed and developed by Germine Youssef. A visit was arranged for a guest speaker who spoke Modern Standard Arabic. However, the speaker's identity, occupation and background were not revealed to the students. The students worked in pairs to prepare questions to ask the guest speaker. The aim was to elicit as much information from the speaker as possible. Questions were to focus on the speaker's background, marital and family status, how he/she came to learn Modern Standard Arabic, the impact of the language on his/her career and life generally, and so on. Individual students took turns to ask the speaker the questions they had prepared. They took notes to summarise the information from the responses. The students wrote reports about the speaker based on the information they had compiled during the visit. Year 8 students were given an assignment for which they were required to interview a family member or friend who had migrated to Australia, and write a report about his/her experiences back in the country of origin. The report was to be written in Modern Standard Arabic. Year 9 students were given two topics and were asked to prepare for a debate using Modern Standard Arabic. The students divided themselves into groups and prepared their speeches for and against the particular issues. Teachers are encouraged to accept whichever dialects the students feel comfortable in using, until the students feel ready to shift to MSA. Teachers can use a contrastive approach to point out differences in the sound systems of the two varieties, for example, some words differ in MSA and the dialect only in the length of the vowel; in other instances the words are completely different. Teachers are encouraged to accept that students will experience difficulties, and that they may be discouraged from learning MSA if they feel pressured to make the transition before they are ready. Teachers can develop their own lists according to which dialects are present in a particular student cohort. The list can be compiled using set curriculum as a guideline. For example, if the Year 7 curriculum contains a topic related to weather, encompassing vocabulary including the names of seasons and vocabulary relating to weather forecasting, the teacher can compile a comparative list incorporating as much relevant vocabulary as possible. Students who have literacy problems undertake a program called Restart which covers all aspects of English (remedial English literacy). However, the focus is on comprehension. Three of the schools involved in our project offer Restart and/or English as a Second Language programs. Two of the programs involve withdrawing students from LOTE, the other seeks to boost students' literacy in both English and Arabic through both a Restart program and an Arabic-English bilingual program. The latter strategy is accompanied by a clear improvement in both languages and in Mathematics (for which Arabic is the medium of instruction). The withdrawal programs yield varied results according to the circumstances of the students. Our study showed that all students have improved in RESTART and ARABIC LOTE. This raises interesting questions which could be the focus of further research: Was the students' improvement simply due to hard work and natural progress over time or did they improve because literacy was transferred from one language to the other? Sarah and Bilal (pseudonyms) are siblings who recently migrated to Australia with their family. They started Year 10 in School A at the start of 2003. They attended year 11 Arabic classes due to their high levels in MSA. Bilal was the only boy in this class. Sarah and Bilal tended to complete their work and the rest of the students frequently relied on their translation to participate. Whenever a question was posed or an explanation required, the other students could not keep up, as Sarah and Bilal were usually quick with the answers. Sometimes the other students did not do their homework and they used Sarah's work in class. The teacher observed that the students had been participating more in class since Sarah and Bilal started attending the lessons however the researcher felt that this was only due to Sarah's help. Sarah's English was good and therefore English was the dominant language in communication amongst the girls. However the girls spoke the Lebanese dialect with Bilal as he did not feel comfortable speaking English. However, their language ability was little affected by this, as they seldom communicated with Bilal. Despite this, the girls noted that they had learned some new Lebanese expressions and idioms and Sarah claimed that her English skills had improved as a result of using it to communicate with the other students.